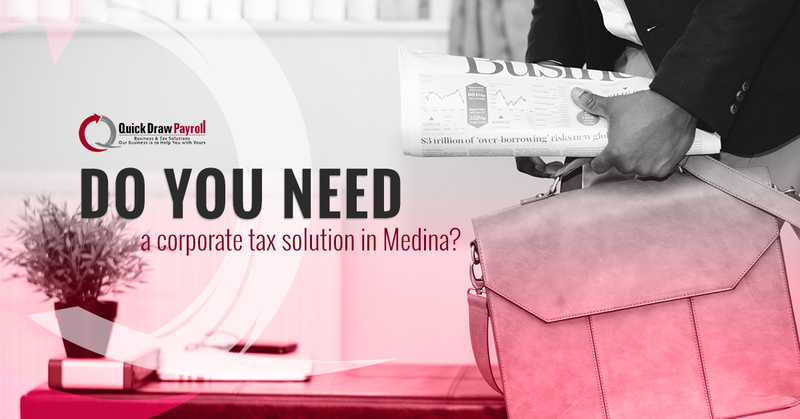 Payroll Services Medina - Do you need a corporate tax solution in Medina? What’s more important: business growth or bookkeeping? Ask the team at Quick Draw Payroll this question, and we’d say, “Yes.” In the midst of growing your business, running business development, and managing your team’s success, you may forget it’s tax season. Instead of scrambling to file taxes and hoping your tax liability doesn’t take a massive chunk out of your revenue, give us a call for custom tax solutions in Medina. Our team has spent years helping corporate businesses plan and file their taxes successfully. Want to learn how we can help you? The following post will discuss the reasons you may need a corporate tax solution. What are tax services worth? This will depend on your business. How much of a headache is it to bookkeep in house, plan taxes, prepare taxes, and submit taxes? In all the years we’ve been providing tax services, the headache is more like a migraine for most corporate and small businesses in the community. Business owners would rather pass off the the responsibility for planning and filing taxes to a qualified, trustworthy team. With this in mind, Quick Draw Payroll will create a custom tax solution for your business in Medina. If you don’t want to deal with the headache of taxes and still want to save money, give us a call today! How much will a custom tax solution save me? Your savings will be determined greatly by your custom tax plan. Depending on your tax liability, your revenue, and other business factors, you could save a little to a lot of money working with the Quick Draw Payroll team in Medina. As we develop your tax strategy, we’ll work on minimizing payout to the government while increasing savings, so you can use your money for your business. What can you expect from a custom tax solution? At Quick Draw Payroll, we make it as simple as possible. Our goal is to make it so you no longer have to worry about your taxes or the legal waters associated with planning and filing. Our community in Medina relies on your business to provide your service. We help you understand the numbers, work for you so you keep as much of your money as possible, and assist you in paying as little legally required to the government. The more money your business has to grow, the better the entire community is because of it. If you’re looking towards the future of your company and your community, give us a call so we can setup a custom tax solution for you. When you think about tax season, consider hiring Quick Draw Payroll for your tax solutions in Medina. We offer a custom plan paired with efficient and effective filing so you can worry about growing your business, not taxes. As a proud supporter of the Hill Country community, we want you to grow and develop your business. Need a tax solution? Give us a call!